The Lions ended its 26-game road-losing streak on Sunday with a 23-20-overtime win in Tampa Bay. The Bucs got touchdowns from wide receiver Mike Williams and running back LeGarrette Blount to take a 14-10 halftime lead. In the second half the Bucs offense was held to only two field goals inside the red zone while the two-minute defense gave up the game-tying and game-winning field goals as Detroit rallied to beat the Bucs. The loss gives Tampa Bay an 8-6 record as its playoff chances took a blow on Sunday. The Bucs now must win the next two games against Seattle and at New Orleans and hope that the Giants lose their last two games at Green Bay and at Washington. The Bucs finally caught a break as Washington missed an extra point at the end of the game giving the Bucs a 17-16 victory improving their record to 8-5. This victory keeps the Bucs hopes alive in the NFC wild card playoff race with 3 games left. The Bucs banged up defense was the story of the game keeping the redskins from scoring in the second half until the end of the half. This effort allowed Freeman and the offense to mount another fourth quarter comeback bringing his total to an amazing 7 time in his short NFL career. It seems that a different player steps up each weekend. This weekend it was WR Arrelious Benn and his 122 yards in the game. The play of the game was Freeman's fourth quarter touchdown pass to tight end Kellen Winslow that finally put Tampa Bay out in front, 17-10. This weekend the Bucs come home to face Ndamukong Suh and the Detroit Lions in what is a must win game for the Bucs playoff hopes. 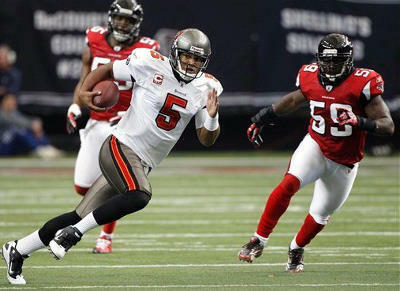 The Buccaneers lose to the Atlanta Falcons 24-21 after blowing a 10 point lead in the fourth quarter. 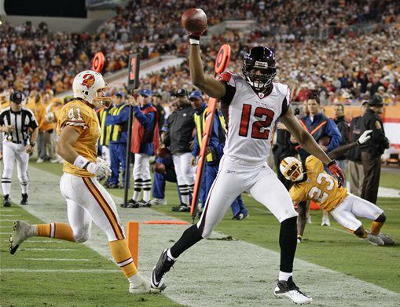 Atlanta's comeback began with a 102 yard kick return for a touchdown by Eric Weeks. 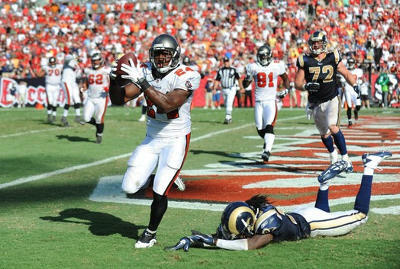 This play was the turning point of the game and you could just hear Buc fans from all over saying here we go again. The come back was completed when Matty Ice connected on a 9 yard touchdown pass to Michael Jenkins with less than 5 minutes left in the game. The Bucs had a promising drive with time running out only to have it end abruptly when Josh Freeman threw his only interception of the game. This was the second time this year they have lost to the Falcons in a game they thought they should have won. The Bucs now drop to 7-5 on the season and must put this behind them fast if they still hope to make the playoffs. The next test for the Bucs will be a trip on the road against the Washington Redskins. The poor play of Bucs QB Josh Freeman and a 14 point Ravens lead in the first half was too much to overcome as the Bucs fell 17-10 at Baltimore. The Bucs defense had another good game, but it was the offense who was never able to get it going as the Bucs fall to 7-4. The Bucs fast 7-3 start this year is a direct result of the good play from QB Josh Freeman and the team's positive, plus 7 turnover ratio. After the game Josh was disappointed in his play and upset that he had missed passes that he normally makes. With a quarterback this young he was bound to have a bad performance sooner or later. The Bucs suffered some costly losses in the game as right guard Davin Joseph and starting free safety Cody Grimm are out for the season. The Bucs must retool before this weekend's pivotal rematch with the AFC South leading Atlanta Falcons. Ok, if you would have told me before the game that the Buccaneers would win easily in San Francisco this Sunday I would have said you were crazy. Given the Tampa Bay Buccaneers' horrible past in San Francisco (1-11) and the state of California (2-23 all-time), Sunday's 21-0 victory over the 49ers is a big one. If you are still not a believer in this young team after today's game, you never will be. Today's win was a big statement win for the Bucs and keeps them in the much contested NFC South division race. This young team keeps impressing us. With its cast of young talent like Josh Freeman, Mike Williams and LeGarrette Blount, the future looks bright for the Bucs. Let's not forget our newest offensive weapon, 305 pound offensive lineman Donald Penn who caught a touchdown pass to put away the 49ers. The road doesn't get any easier as the Bucs must travel to Baltimore to take on the Ravens. After seeing how well the Bucs have played on the road this year I think they will be ready for the challenge. 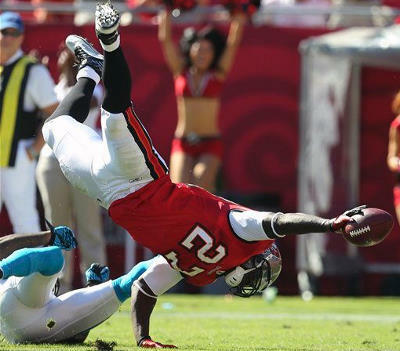 The Buccaneers bounced back from a loss at Atlanta to beat the Carolina Panthers, 31-16, and sweep the series. The Bucs moved to 6-3 on the season, doubling their win total from a year ago. It's too bad that nobody saw the game with the blackout in effect. The announced attendance was 44,264 at Raymond James Stadium. The actual attendance was likely a few thousand shorter than that. However, the crowd that was on hand saw quarterback Josh Freeman bounce back from a bad second half in which he was picked off twice in Tampa Bay's 27-21 loss at Atlanta last week to throw two touchdown passes to help the Bucs build a 21-10 lead in the first half. Freeman finished the game completing 18-of-24 passes for 241 yards with two touchdowns and no interceptions, and used play-action to really hurt the Panthers' defense. Running back LeGarrette Blount, who was stuffed for no gain on fourth-and-one at the Atlanta 2-yard line late in the fourth quarter, had a bounce-back game, too. The 6-foot, 247-pound bruiser rushed for 91 yards on 19 carries and a touchdown. The Bucs will be on the road next week as they travel to play the San Francisco 49ers. The Buccaneers had made a living off of come from behind wins this season, but Josh Freeman and company came up just short losing to the Falcons 27 to 21. With time running out in the game, the Bucs embarked on an 89 yard drive that ended in a fourth and one on the Falcons 2 yard line. The Falcons were able to hold off the Bucs on that fourth down possession and preserve the win while taking control of the NFC south division. It's easy to see that the Bucs seem to improve with each game as Josh Freeman is turning into a franchise quarterback right before our eyes. As the season continues the Bucs are going to be a team to deal with in the NFC. If you overlook them you will find yourself on the losing end of the ball game. The Bucs are back at home next weekend as the Carolina Panthers come calling. Hopefully the Bucs fans will come out and support this young up and coming team. The Tampa Bay Buccaneers tie a team record with their fifth straight road victory as they win 38-35 over the Arizona Cardinals today at University of Phoenix Stadium. They may have found another piece of their offensive puzzle in running back LaGarrette Blount. 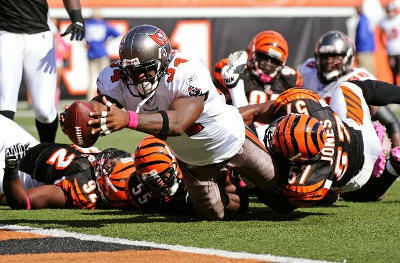 Blount scored two touchdowns and ripped off a huge run near the end of the game helping the Bucs preserve the win. The undrafted rookie from Oregon finished with a career-high 122 yards on 22 carries. Josh Freeman continues to impress completing his sixth fourth-quarter comeback in just his 16th NFL start. He was 18-of-25 passing for 278 yards and a touchdown. The Bucs defense also scored two touchdowns on interception returns. Aqib Talib made his second interception, and fifth of the season, with 2:10 to play at the Bucs 6-yard line. Blount followed that with a 48-yard burst, hurdling a defender just past the line of scrimmage that would help finish the Cardinals as the Bucs defense stopped them from making a last minute drive. The Bucs go on the road next week to face the Atlanta Falcons. Josh Freeman drove the Bucs 81 yards in 16 plays for the game-winning score, overcoming a silly personal foul penalty by James Lee and converting a fourth down along the way. Freeman hit Cadillac Williams with a one-yard touchdown pass with just 10 seconds left to play as the Buccaneers rallied for an 18-17 victory over the Rams. Connor Barth kicked four field goals and rookie running back LeGarrette Blount gave the offense a needed boost. Freeman has now led fourth-quarter rallies that produced wins over Cleveland, Cincinnati and St. Louis this season. However, the Bucs must stop hurting themselves, committing 12 penalties for 92 yards. Plus a personal foul by offensive tackle James Lee set back the offense with less than two minutes remaining, and Blount had two long runs brought back by penalties, including a 36-yarder in the fourth quarter. If the Bucs are going to continue winning they must eliminate these mistakes. 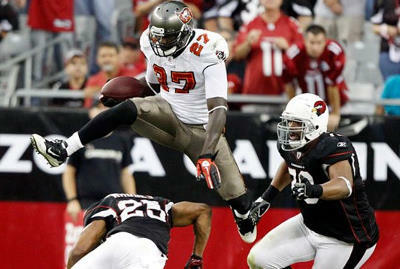 The Bucs go on the road next week to take on the Arizona Cardinals. The Super Bowl champions came into town on Sunday and totally dismantled the Buccaneers 31 to 6. This was the second time this year the Buccaneers have been blown out by a quality team, first Pittsburgh 38 -to 13 and now New Orleans. 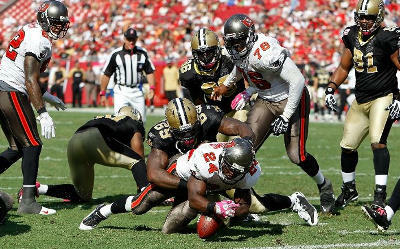 In both games the Buccaneers were out played in every aspect of the game. Once again the Buccaneers' running game, which has struggled mightily all year, was a non-factor on Sunday. The Buccaneers totalled just 42 yards on 18 carries. This was the third straight game that the Buccaneers' defense did not record a sack, gave up a touchdown pass of at least 40 yards and was gashed by a running back for 143 yards or more. The Buccaneers don't seem to be getting any better and with the Rams coming to town this Sunday the forecast is not good, but with every new Sunday hope springs eternal. Earnest Graham helped to secure the 24-21 victory over the Cincinnati Bengals when he ended a crazy lateral-filled kickoff return in the game's final seconds. Graham also turned in a 61-yard run and scored a touchdown on an acrobatic one-yard carry. The Buc's defence picked off Carson Palmer twice and scored 10 points in the last 1:26 of the game to stage an unbelievable, last-second rally to beat the Bengals. Michael Spurlock's incredible toe-tapping catch with five seconds to play set up the game-winning field goal. This was a good road win for the Bucs, but they must put it behind them quickly as they prepare for the New Orleans Saints next week. It was as if the Glazers knew this could be a really ugly loss for the Buccaneers so they chose not to purchase the few thousand remaining tickets. This insured that the Bucs and Steelers game was subject to black out rules by the NFL in the Tampa Bay area. In retrospect we should all thank the Glazers from saving us all from witnessing the dismantling of the Bucs. 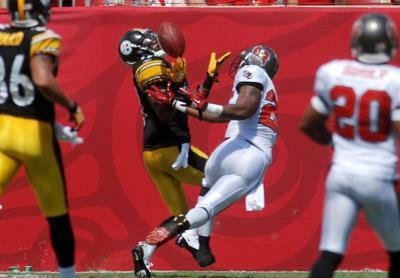 The Bucs lost 38 to 13 on an afternoon when the Steelers seemed to get every break and bounce during the game. If there is a bright side to today's game, it's that quarterback Josh Freeman wasn't the reason for the loss. Freeman was 20 of 31 with no touchdowns and one interception. This is something the coaching staff can build on. The Bucs have a bye week next week to heal their wounds and prepare to go on the road to take on the Cincinnati Bengals on October 10th. The Buccaneers go on the road and earn a hard fought victory over the Panthers 20 - 7 in Carolina. This contest was advertised as the battle between the two youngest teams in the NFL and there can only be one winner. After winning only three games during the 2009 season, the Buccaneers are now only one win away from tying last season's win total. 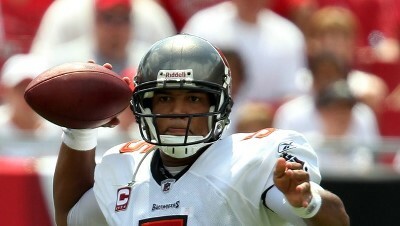 Quarterback Josh Freeman was very poised throwing for two touchdowns and rushing for 43 yards in the victory. Freeman played so well that it was hard to believe that this is only his second year and that he is only 22 years old. The Bucs defense also played well keeping Carolina out of the end zone for most of the day. For the second straight game the Bucs defense has not allowed their opponent to score in the second half. The Bucs will be a home next week to play the Pittsburgh Steelers. Hopefully this game isn't subject to blackout with how well the Bucs have been playing. 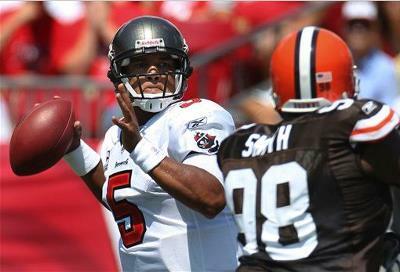 The Bucs were successful in their season opener beating the Cleveland Browns 17 - 14. Unfortunately, the Tampa Bay area was not able to see it. After the Bucs fans suffered through a 3 - 13 record in 2009, starting the season off this year with a win was bittersweet. Due to poor attendance, this weekend's Bucs game was subjected to blackout rules by the NFL. After missing most of the preseason due to injury, Josh Freeman who looked rusty at times, threw for 182 yards and two touchdowns. 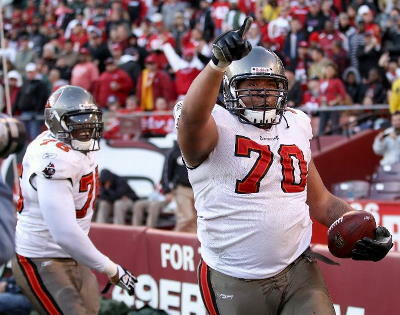 He led the Bucs back from a first-half deficit of 14 - 3 for the Bucs first win in 2010. The Bucs are off to Carolina to play the Panthers this weekend so the Tampa Bay area may get their first chance to see their Buccaneers win this year. 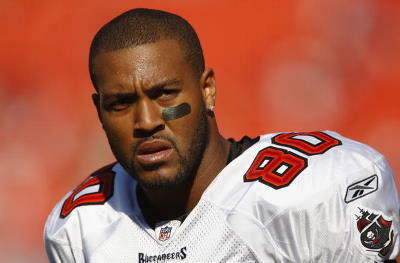 The Tampa Bay Buccaneers cut wide receiver Michael Clayton on Saturday. The fact that Clayton didn't play in the Buccaneers' final preseason was a sign that the receiver's time in Tampa was over. Clayton, who signed a five-year contract worth as much as $26 million last year, will still receive $3 million in guaranteed base salary this season. $3 million is not a bad parting gift. Clayton was a first round pick in the 2004 NFL Draft. In his rookie season he had 80 receptions for 1,193 yards and 7 touchdowns. He was never able to duplicate that success again. Clayton only averaged 348 yards and 28 receptions over the next 5 seasons. In 2009, Clayton caught a career low 16 passes for 230 yards and 1 touchdown. This was the beginning of the end for Clayton. After being cut, Michael Clayton took the news in stride upon being let go.